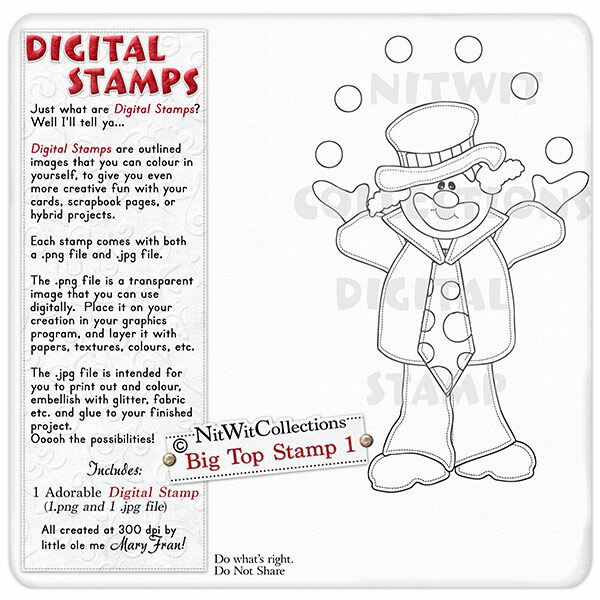 Big Top Digital Stamp 1 is just what we all see at the circus. A Clown! He happens to be juggling balls, but you could easily remove the balls from the scene if you just wanted the clown. This digital stamp would also work excellent for a birthday themed project. The choice is yours with this digital stamp. A great creative addition for your card making, scrapbooking, and hybrid scrapbooking projects. 1 Clown Stamp (2 files - 1 image is a .png file and 1 is a .jpg file format).